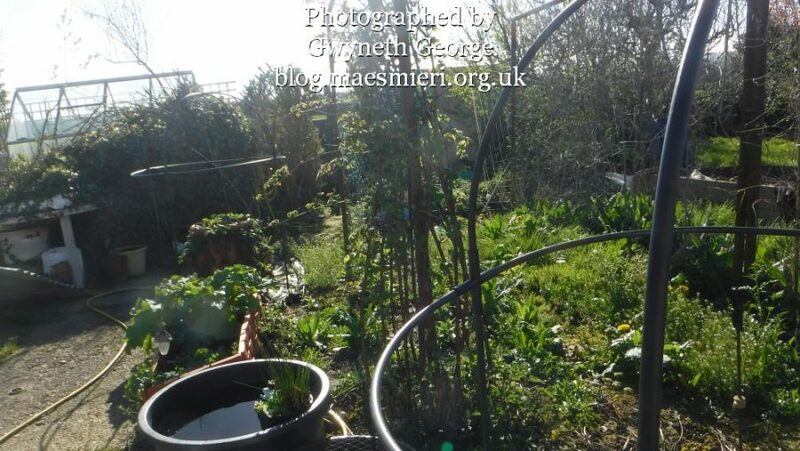 Anybody who visits my blog regularly may well have realised by now that, as well as crafting, I like gardening. But my health/disability problems means I can not do what I’d like or as much as I’d like. So these days a lot of my gardening is done in raised beds, hanging baskets, barrels, etc. There are fruit trees and bushes in the garden, but I can pick from them while sitting in one of the numerous chairs I have dotted all around the garden. 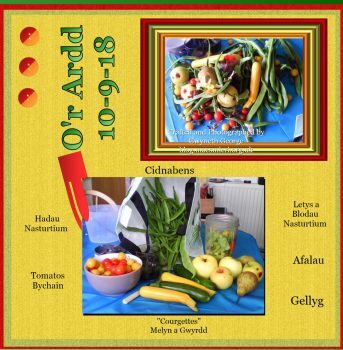 the only two crops that are sewn directly into the ground are peas and runner beans, and I had help to sew them, and again picked them by having strategically placed garden chairs. 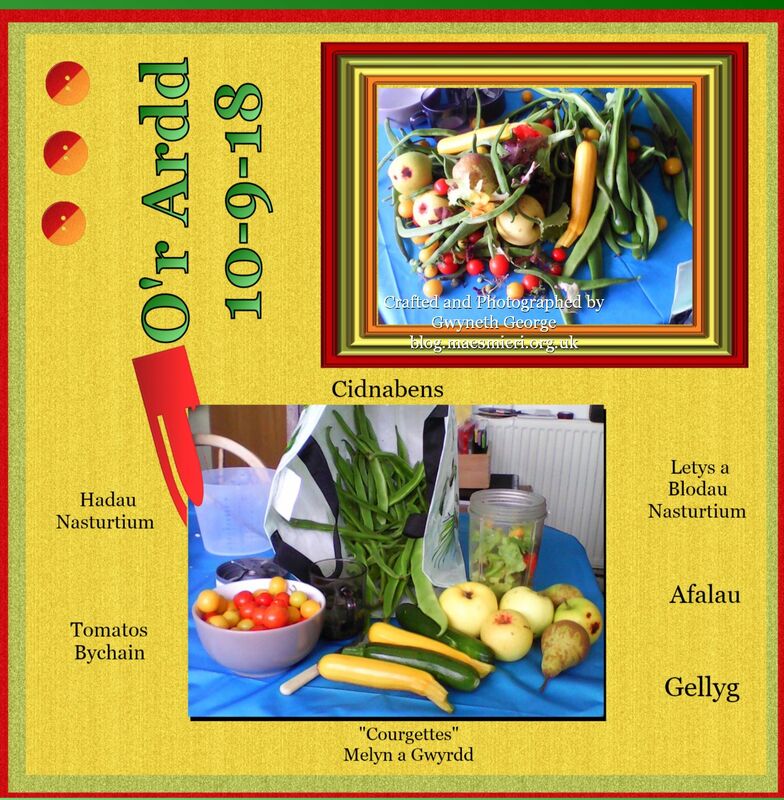 Some things have been a bit of a disapointment, crop wise, this year, but mostly I’ve got a fair assortment of things from the garden that have given myself and my mother a nice variety in our food, as well as giving some away to friends and family. So, I took a bag out on the morning of the 10-9-2018 and picked, and then tripped the whole lot out onto the kitchen table, and this is what I’d got. A bowl full of cherry tomatoes, both yellow and red tumblers grown in two hanging baskets. The seeds from Nasturtiums soaking in salted water in a cup to make poor man’s capers. 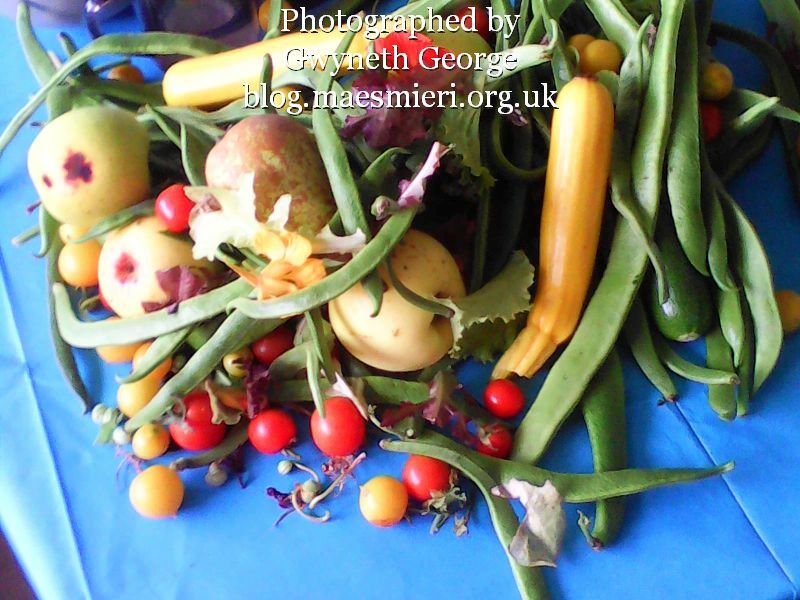 Runner Beans – ready for my mother to string and cut up. Assorted cut and come again mixed letyuce leaves with nasturtium flowers ready to add a few things to make a smoothie. 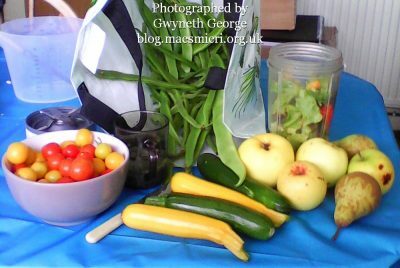 Yelliw and green courgettes that have grown well in my “jungle raised bed”. And this is the digital scrapbook layout I made using these photos. 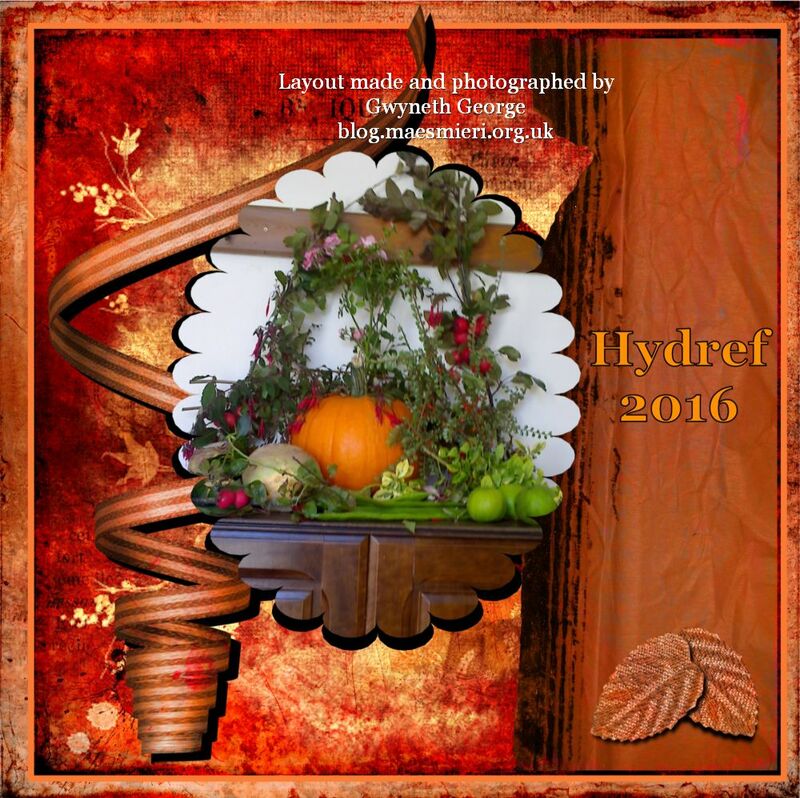 I used the Citrus Celebrations Digital Mini Kit from Dragons Lair Designs. 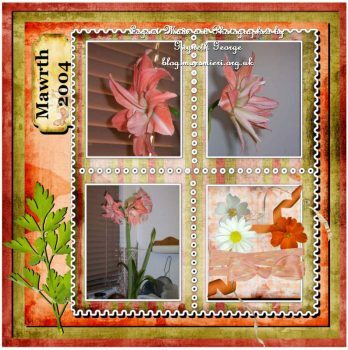 I worked on the layout in My Craft Studio Elite software. 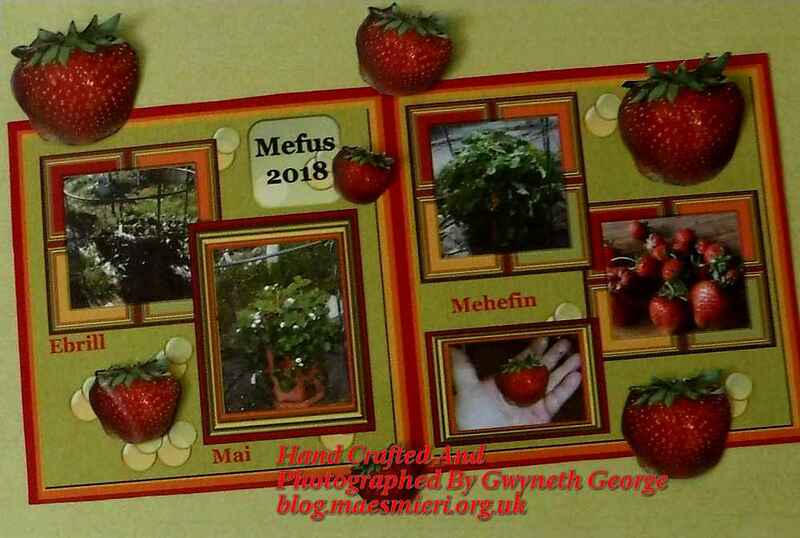 I’ll still have a variety of craft I’m working on, as well as some that I have finished, that I need to blog, so please do pop back to have a look. If you’ve not visited my blog previously you may not know about the blank calendar from Papermill Direct that I gave to my mother, which I’m decorating for her month by month. You can catch up by visiting my previous pists about it if you want. I’ve not blogged the early months of the year, but you can see the post for April – here, for May – here, for June – here, and fot July – here. I’m trying to decorate the pages for each month using different types of papercraft. Had a discussion with my mother who reconed that it was time for something from the garden. And I had an idea! 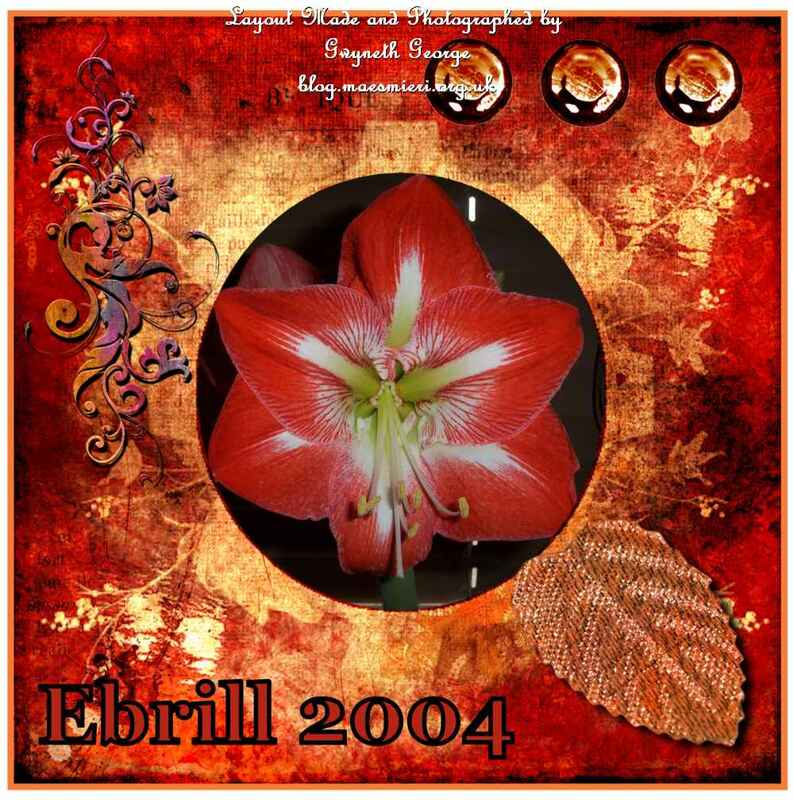 – why not turn some digital scrapbooking (that I’ve shown you previously) into a bit of hybrid crafting. I’ve shown you two digital scrapbook layouts showing the development of sreawberries in my garden previously. I took both layouts into my software and placed them side by side and shrunk them to the size I wanted for this project. 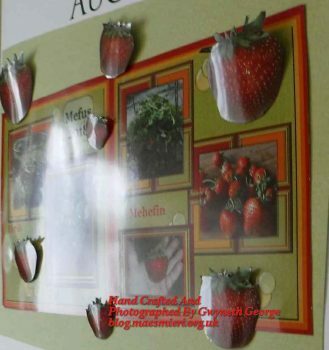 I also clopped out a single strawberry and put several copies at fifferent sizes on a blank area of the page. This was then printed off onto A4 glossy photo paper. A whole sheet of the same green background was also printed off onto A4 Super Smooth cardstock. 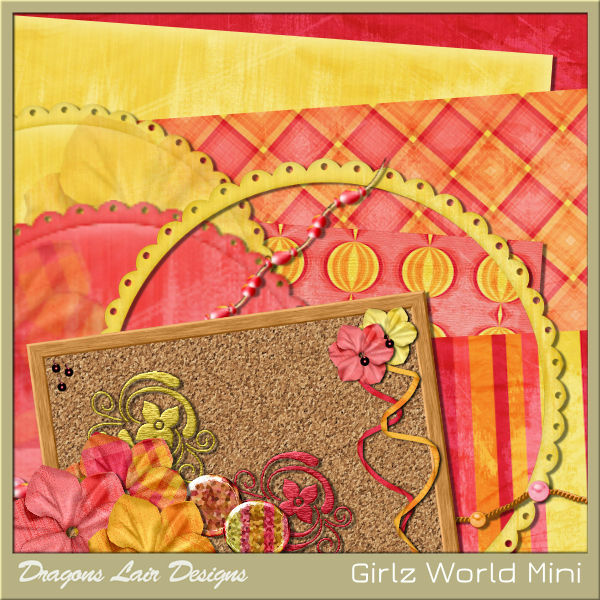 All the frames and backgrounds come from the Dragons Lair Designs Citrus Celebrations Digital Mini Kit. After trimming the green background to a size suitable gor the calendar, I cut out the double layout spread as well as each of the individual strawberries. I stuck the layout onto the background at a jaunty angle using fingerlift tape. I shaped the strawberries a bit and then stuck them in place using Pinflair Glue Gel. Here’s a look at it from an angle, showing some dimension. It’s difficult to get the dimension to show without glare off the glossy photo psper. This is what the whole page looks like. So, that’s the August page. I now need to think of what to prepare for the September page. I’m sure I’ll be blogging what I make at some point during next month. Several of those amongst my online friends have noticed that I’ve not been very active online for the last few weeks – thank you for noticing and commenting. There’s nothing to worry about – it’s just that I’ve been using what little energy I’ve had on other things, and, although I have been online a bit every day I’ve just been too exhausted to do as much commenting and be as active in FB crafting groups as I like to be. I’ve even realised now that I’ve not even been in some groups and put up links to the small number of my own blog posts that have gone live this month. My main activity has been puttering around in the garden. I would like to be able to tell you that I’ve got everything I wanted to do all finished in the garden, but unfortunately not. With my health issues and disabling conditions I can only do little bits at a time, and need help with some things, and with the high temperatures we’ve had lately those “little bits at a time” have had to be early in the morning or late at night. It started off in April with more weeds than plants. And half the garden is still more weeds than plants I want, but one half is getting closer to what I’d like. I’m hopeing to do some scrapbook layouts, progress report blog posts, or slideshows of how I progressed, in due course, and hopefully I’ll get more of the half I’m working on this year into a more organised state before the summer ends. But now it’s raining and I can do a bit of catching up. Hurray! So, although I’ve not posted a lot to my blog this month, I know that I’ve missed posting in some FB groups when some of my posts have gone live, I thought I’d give you a list of all my July posts to start off with. So, other than gardening, what else have I been up to? – Not a lot! With the temperature being so high I just couldn’t face getting out my sewing machinen and continuing work on my “Big Work In Progress” – just the thought of having the quilts on my lap and manouvering them round as I did more quilting on them was enough to bring me out in a sweat. Once the temperature cools, and once I have less to do in the garden, I will be back quilting, and I will keep the update posts comming. But, although I haven’t had my big sewing project out I have had my sewing machine out and sewn a couple of pairs of shorts for the youngest nephews. I’ve got a blog post part written about them, though I’ve only managed to get one nephew to stand still long enough to photograph him wearing his shorts yet. I’ve also made another couple of batches of Christmas Cards. Brain not in gear to go all out for a big batch yet, but have put some together to sell at our chapel when a proportion of the proceeds go towards the work of the Sunday School. I’ve been requested for some simple cards that will go through the post as a standard letter – many don’t want to pay for elaborate cards or to pay for a Large Letter stamp, so what I’ve made so far fits into the not to expensive or large category. Others want a small number of more elaborate cards for delivering by hand or putting in with gifts for special friends and family, so I’ll have to start thinking of those cards over the next month or so. I will get what I’ve done photographed and blogged before long, so keep an eye out for those posts as well. To finish I thought I’d show you my strawberries! 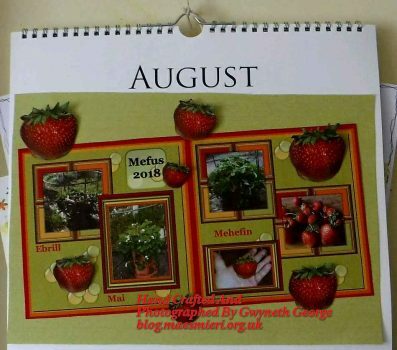 I made a post of a layout “Strawberries Digital Scrapbook Page” back in May. 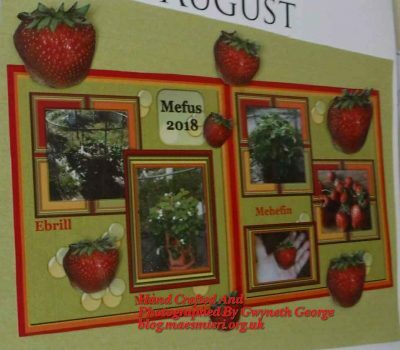 I decided to make a further Digital Scrapbook Page, using the same Cirtus Celebrations mini kit as I’d used before to show what we got from the strawberry barrel at the end of June. There are two breeds of stawberries in the tub, ordinary sized ones round the sides and plants that produce giant strawberries in the top. 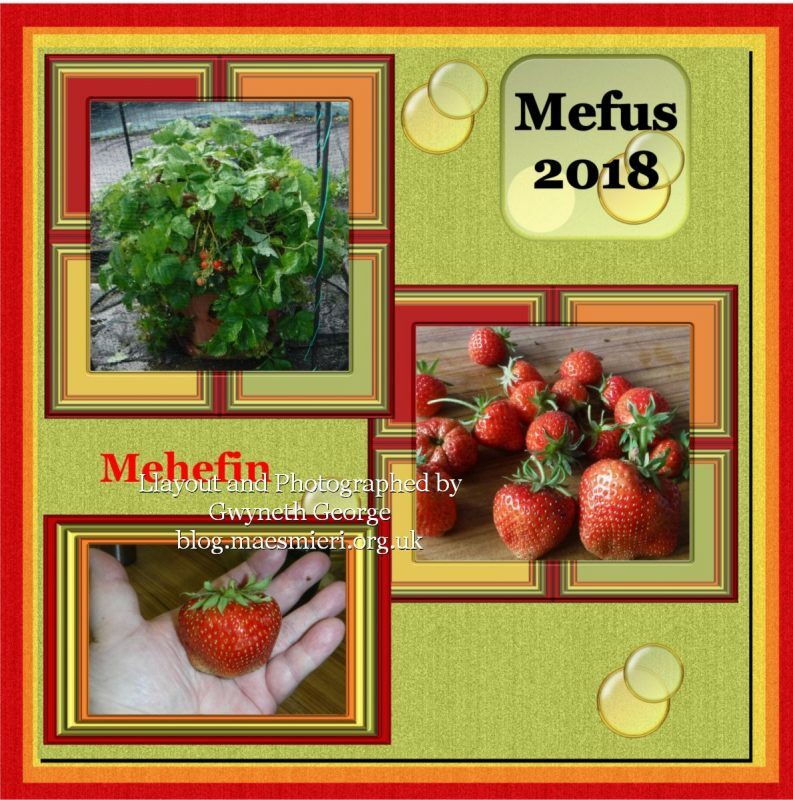 That’s my hand in the picture – the giant strawberries were more than 2″ across. We had lots to eat, some to freeze, some in smoothies, and I even dried some in a food dehydrator I got for my birthday – these dried strawberries I used when makeing a type of fruit and nut bar. 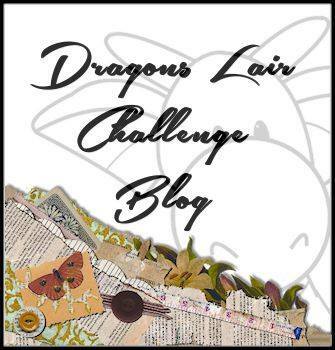 Dragons Lair Designs have a new challenge! The details can all be found on the Dragons Lair Designs Blog – here! A challenge with a bit of difference this time. You need to create something, anything at all, either physical or digital, using any items from two digital mini kits. One you can buy in the store and the other you can collect for FREE from the blog. 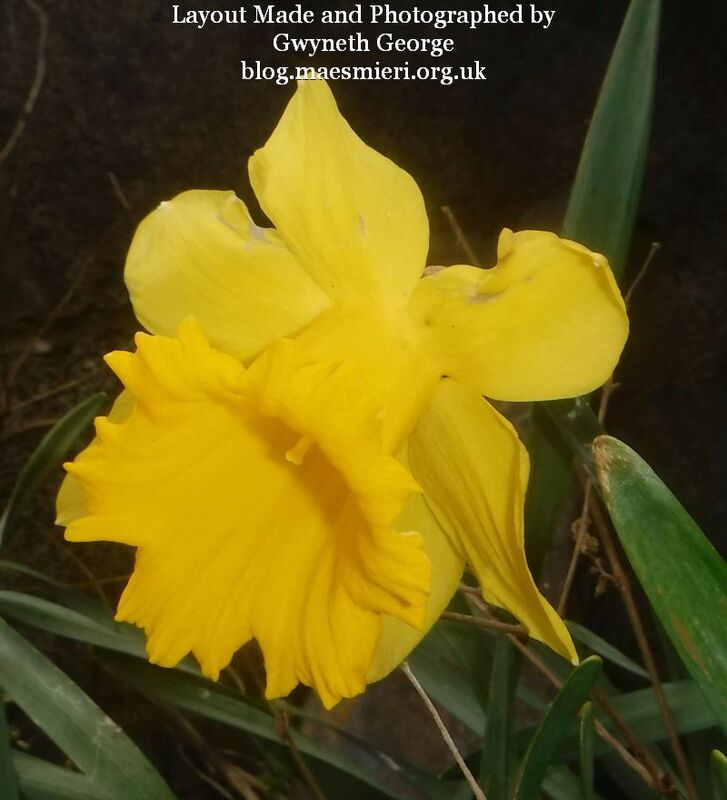 As soon as I saw the yellow colour in the kit image the first thing that jumped to my mind was the daffodils that I’d been looking at earlier in the day outside our front door. So off I clicked to get both parts of the kit, and then I nipped outside (OK I don’t “nip” anywhere with my dodgy leg, etc., – it was more of a slow crawl LOL) and took some quick photos of some of the flowers. It was then a case of selecting at least one digital element from both the mini digital kits and then putting everything together to make a digital layout. In the end I decided to cluster and overlap my photos. the main background at the back came from the freebie mini kit and the rest of the elements came from the mini kit from the store. I think my next post will be making a card with the image I screen printed that I showed you in my last post so please pop back in a couple of days to see that. 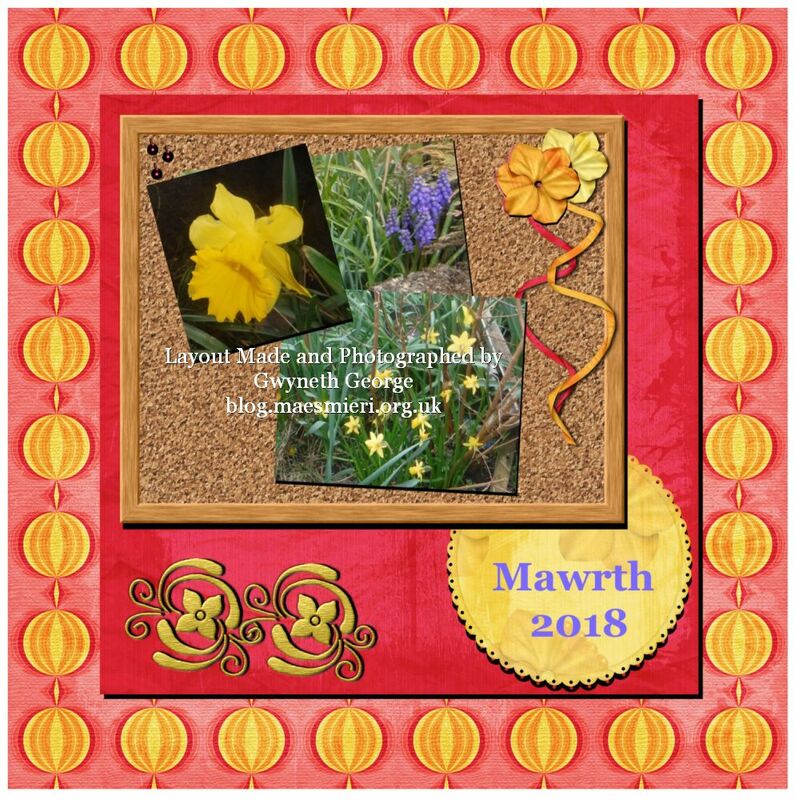 It’s time for me to show you another DT inspiration piece as today we see the start of a new challenge on the “Dragons Lair Designs Challenge Blog“. We have a picture inspiration challenge for you this month. 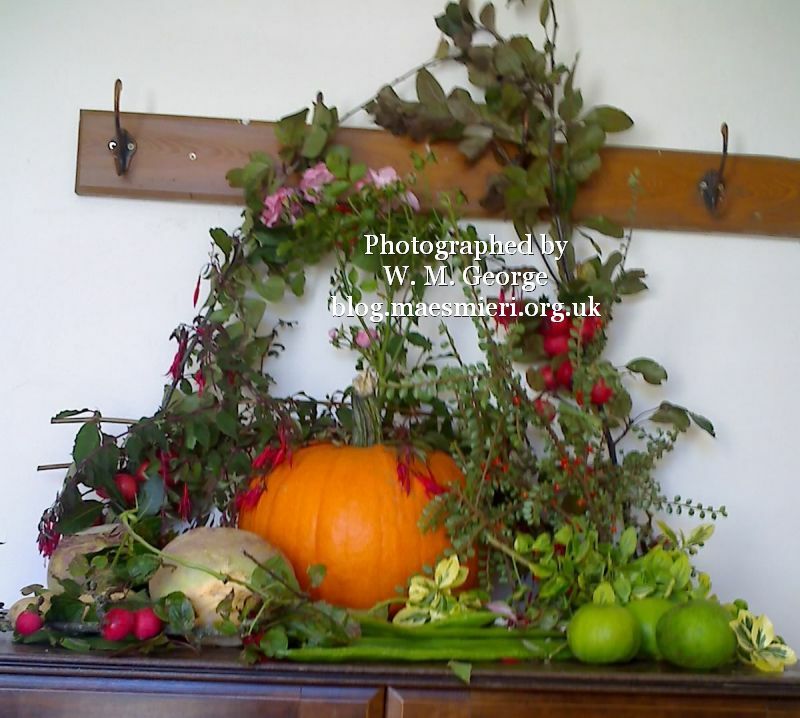 There are so many different directions you can go for this theme – You may choose to work on anything using the colours from within the picture, or perhaps harvest, or thanksgiving, or choose just one item from within the picture to concentrate on. So many ideas to play with. I can’t wait to see what everybody comes up with this month. There just wasn’t enough time on the day of our thanksgiving service at the chapel for me to do everything, so I gave my 10 year old nephew a bucket full of vegetation he’d helped me cut, some fruit and veg, and asked him to make a display in the lobby while I got on with other stuff. Then I gave him my phone to photograph his creation. He even got a dustpan and brush and swept up the leaves and petals that had fallen on the floor while he was working. He even came back with me later in the week to clear everything he’d put up before the following week’s service. So this month I decided to use his photo of his display to make a quick digital layout using one of the Dragons Lair Designs collections to go with it. I have printed it out as well to add to my mother’s collection of my 8″ square layouts. 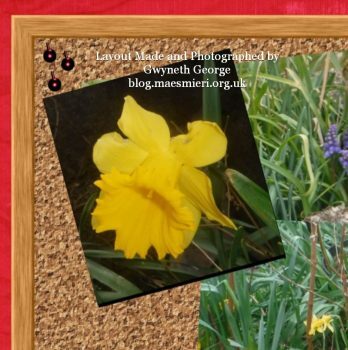 I started off by taking several items from the DLD collection I’d chosen, together with a slightly cropped photo my nephew had taken into My Craft Studio. I then used a digital cutter within the software to shape the photograph before laying everything out and resizing until I was happy with my layout. The theme for the October challenge is – “Boo!”. From the scarry to the fun, anytype of crafting. 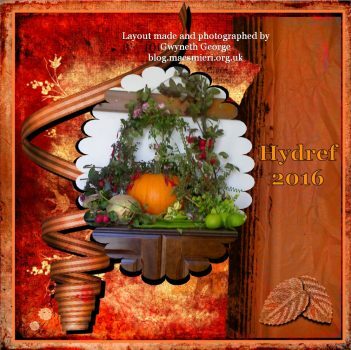 Please join in and let us see your crafted creation. I can’t wait to see what everybody comes up with this month. 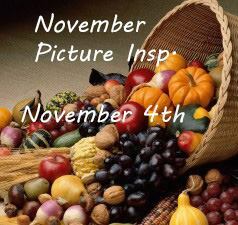 I looked back to my photos from October 2015 for photos to make a digital scrapbook layout as inspiration for you this month. I chose a “haloween” themed collection from Dragons Lair Designs for my creation this time. 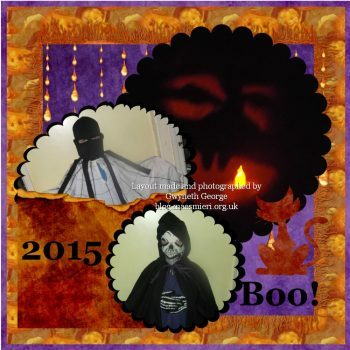 I picked photos of two of my nephews dressed up in their Haloween costumes – a large black spider with 8 long legs on a giant spider’s web, and skeleton with black hooded cape – together with one of the pumpkins that they’d carved, and used a digital cutter within the My Craft Studio software to cut them into scalloped circle shapes with black matting and layering. I also used a digital cutter from within the software to cut a cat shape from one of the backgrounds in the digital collection. I then had some fun laying out everything at different sizes and positions until I was happy with the layout. I then printed out a copy for my mother’s collection of my 8″ square layouts although it’s the digital layout that you can see in this post. 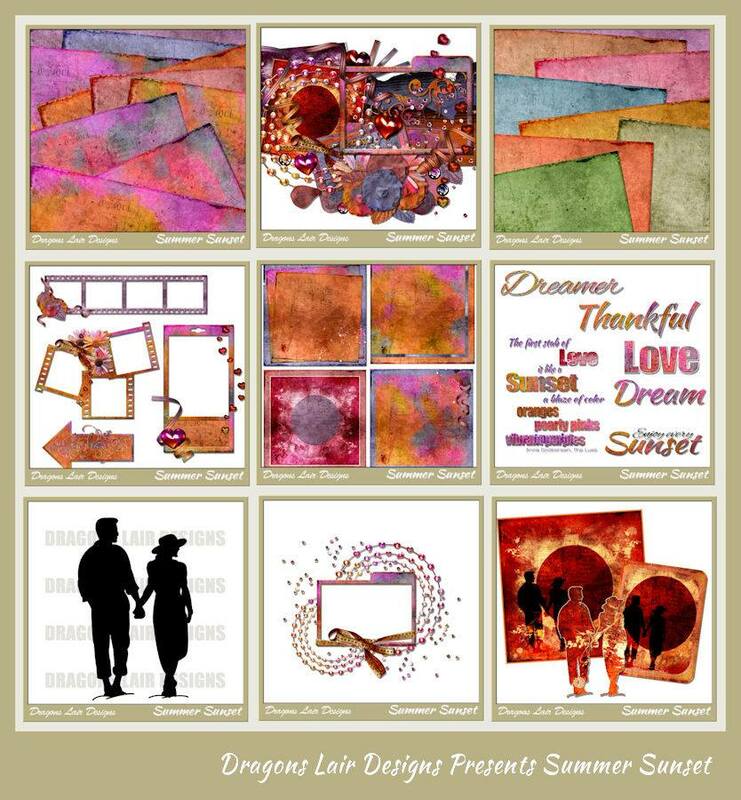 The new collection from Dragons Lair Designs is called “Summer Sunset” and it includes some gorgeous colours. You can find the collection for sale in the DLD online store – Here! For today’s launch I decided to keep my creation simple – a digital layout of a flower I grew a few years ago. Elements from the new “Summer Sunset” collection. I simply took my photo into the My Craft Studio software and pulled in various items from the collection, working with sizing and positions until I was happy with my layout – really simple! Here’s a quick look at some of what you can expect in the collection – some are available as freebies in various DLD areas such as the Inspiration Blog, and Fan Group, so do pop into DLD land to have a look. Oh! and did I say that there’s a big discount for a short while?! 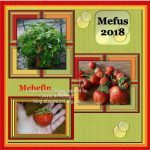 Where is the time going – already the 1st of June and it seems like the year just started a few weeks ago. 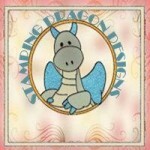 As it’s the 1st of the month it’s time for the launch of a new collection over in the Dragons Lair Designs online shop. This month the collection is called “A Taste of Summer”. 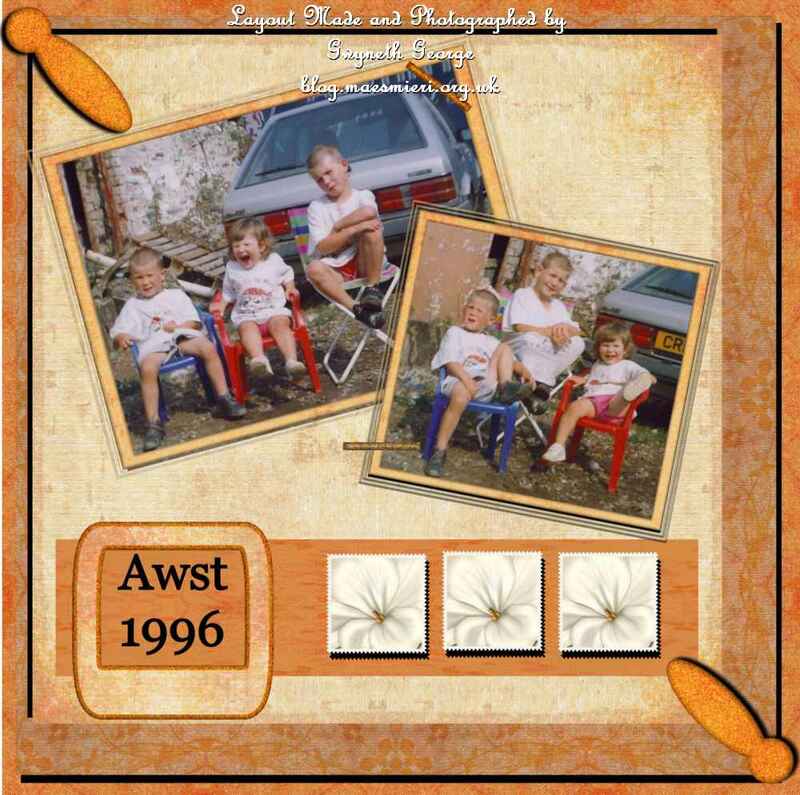 A few days ago I showed a clip from a digital scrapbook layout as a bit of a sneaky peak online. 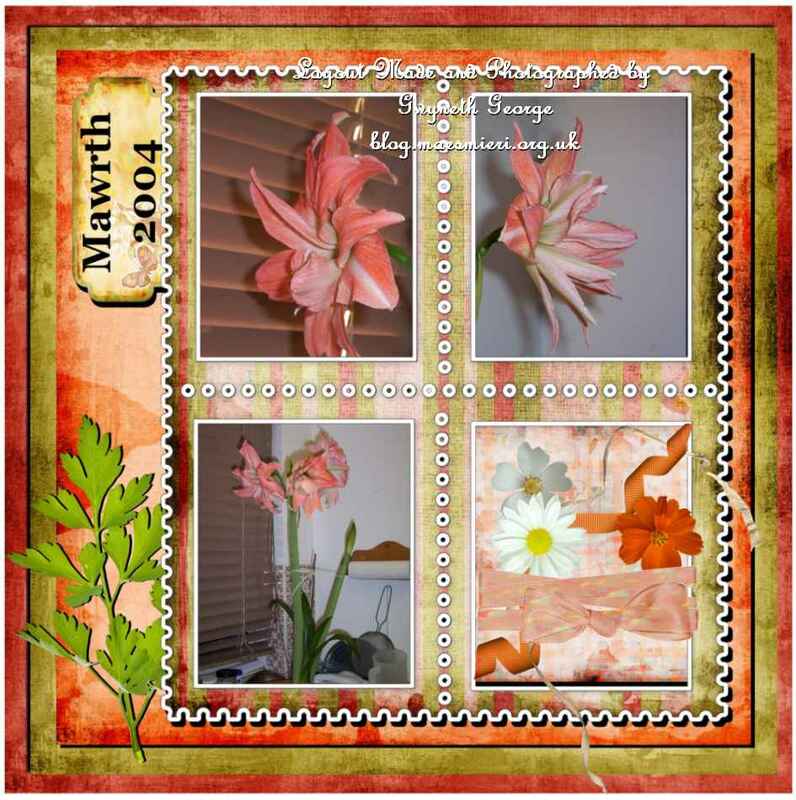 Today I’d like to show you the full digital scrapbook layout. 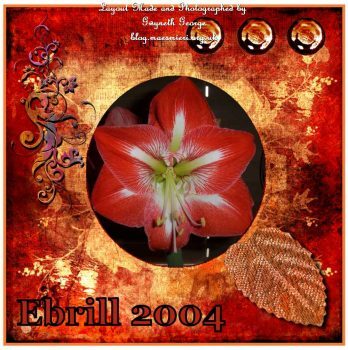 I found a couple of pictures of an Amarylis I grew a few years ago to put in my layout this time. Elements from the new “A Taste of Summer” collection. 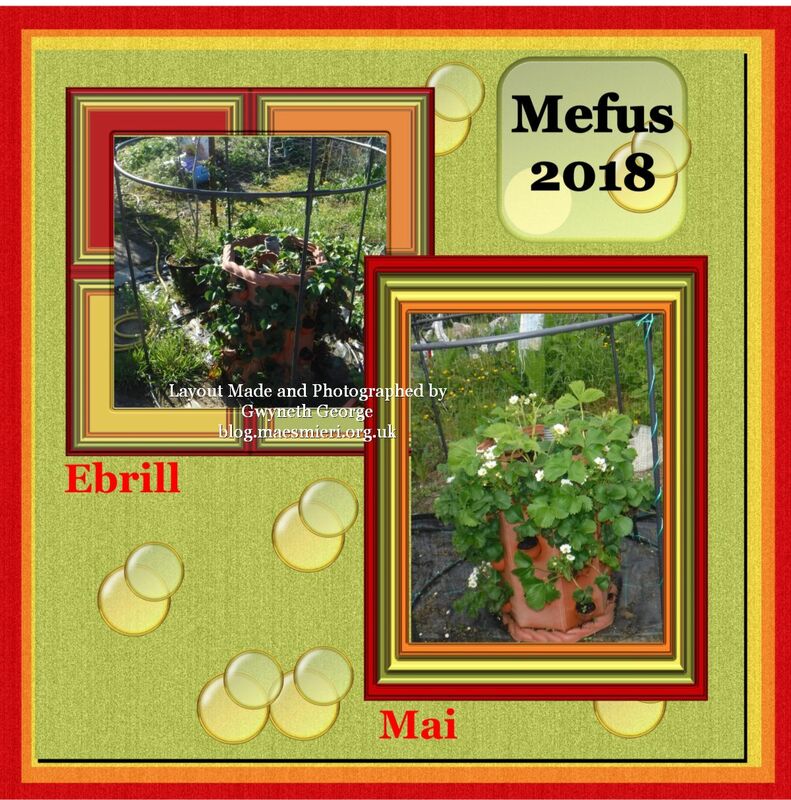 I found two pictures from my digital photo library and took them into my software, together with lots of items from the brand new collection. I then moved around, resized, added drop shaddows, etc., until I was happy with the layout. It is actually two flower heads in one photo that you can see across the top two boxes. We have lots of different activities going on in the Dragons Lair Designs Fan Group during each month. For one of these challenges, which runs from 20th of one month to 19th of the next, we get given a mini collection to play with and make any layout we want. This can be a digital layout, print out and make any size scrapbook page, a layout for a card front, whatever we feel like. I’ve made a digital scrapbook layout for the May/June challenge. 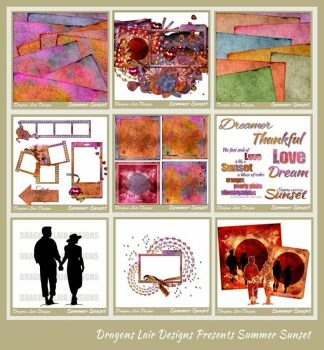 Lots of items from the “Infinite Love” mini collection – currently available free to take part in the May/June layout challenge in the Dragons Lair Designs Fan Group. 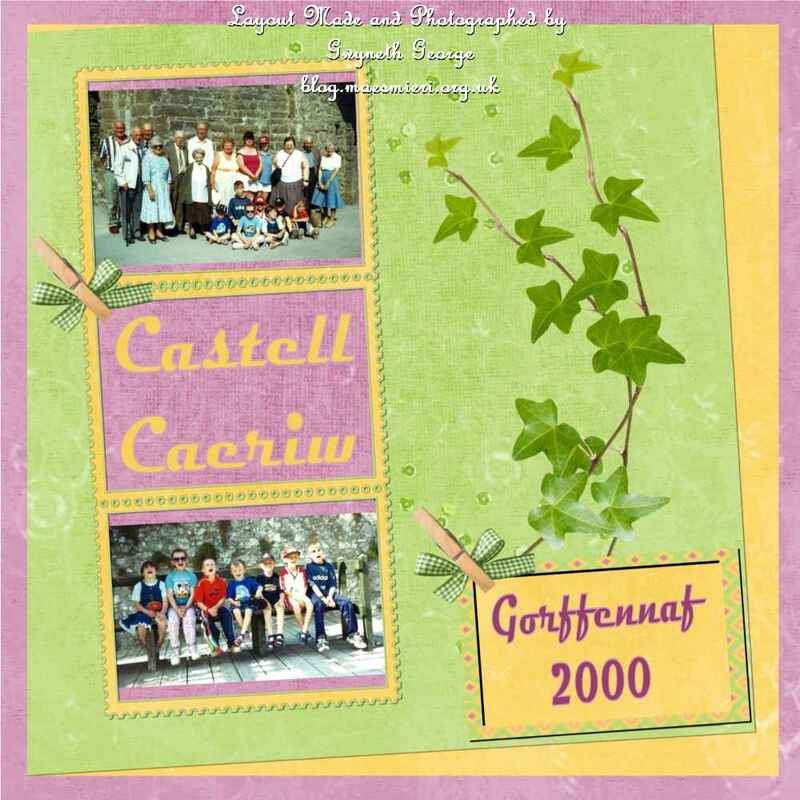 I found two pictures from my digital photo library and took them into my software, together with lots of items from the mini collection. I then moved around, resized, added drop shaddows, etc., until I was happy with the layout. 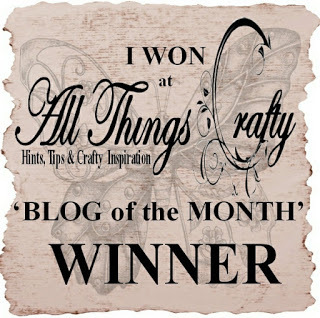 We are currently in the middle of running a Blog Hop event over in Dragons Lair Designs Land. It will run until 8pm UK time on Tuesday, 17th May, so a whole day left to join in if you want to collect the freebie collection on offer to all hoppers. I know I’ve already made a matching set – card, poster, and framed wall art – from the freebie collection already – which can be seen on my Blog Hop post -> Here! – but I couldn’t resist having another play with it this morning. I went for a digital scrapbook layout this time. 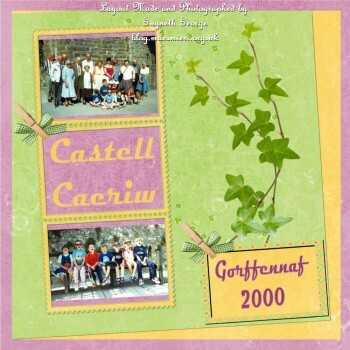 I raided my digital library of photos and picked two from a Sunday School trip quite a few years ago now. I took these, along with items from the freebie collection, into the software and played around with layout and size until I was happy with the look of it. As I didn’t want the wording from the quick page I used as the main element I put a panel on top of that and added the date. I also used one of the apertures to put in the location rather than a third picture – which just shows that you can play around a lot with what you get in the collection.